Welcome! Here’s where you can request a public works maintenance service. We appreciate your request and thank you for being our "eyes and ears" in the City of Oakland. This web site is for NON-EMERGENCY services only! For potential emergency situations, please call (510) 615-5566. You may submit a Service Request online, by phone, by email or by mobile app. Online: To submit a new service request, click here. Mobile App: SeeClickFix or OAK 311, available in the App Store for Apple devices and Google Play for Androids. Please view our Call Center presentations to help you. Presentation en Espanol. Presentation in Chinese. The City has a unique program that provides rewards to witnesses who help stop people illegally dumping in Oakland neighborhoods. With the Reward for Reporting Illegal Dumping Program, witnesses who report illegal dumping can receive up to half of all penalties collected in successful enforcement actions based on the witness’s reports. 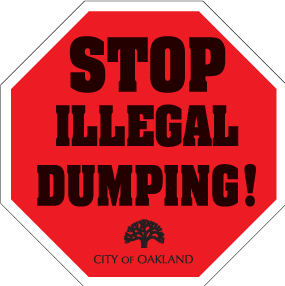 This sends a strong message that Oakland will not tolerate illegal dumping in our neighborhoods and City streets. This program in intended to encourage the public to help identify and put a stop to perpetrators' illegal behavior. Click here to find out how you might earn a reward and help stop illegal dumping. Click on Parking Matters for Oakland's website on all things related to parking on City streets. The United States Environmental Protection Agency (EPA) in collaboration with the California Regional Water Quality Control Board (RWQCB) is spearheading an effort to keep the Bay clean. The EPA and RWQCB are requiring the East Bay Municipal Utility District (EBMUD), six East Bay cities, and one sewer district to fix old, cracked sanitary sewer pipes to ensure they don't allow the infiltration of rainwater which can overwhelm wastewater treatment facilities, resulting in untreated or partially treated sewage being released into the Bay. As a result, EBMUD and its partners are phasing in a Regional Private Sewer Lateral (PSL) Ordinance in some east bay communities. Affected property owners will be required to obtain a certificate from EBMUD indicating that their PSLs are without defects and have proper connections. Follow the link to EBMUD's website for the requirements on the East Bay Regional Private Sewer Lateral Program.